My Country Roads: Wild and Wonderful : Labor Day - Literally .. etc..
Labor Day - Literally .. etc..
Today is Labor Day celebration in the States. Being in the military base, we get to enjoy those holidays too wherever we are. To start our day, I cooked tosilog for our breakfast because we need to eat something hearty before we joined the walkathon. 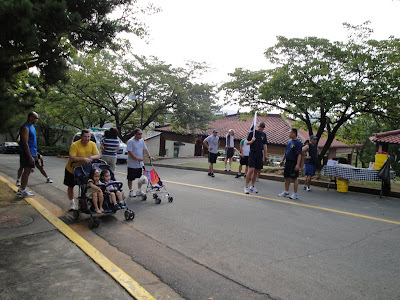 We have participated to the 2.5K Family Walk here inside the base. Only two families participated, including us. We've finished 2o minutes and 42 seconds. We've shed sweat so that was our first exercise for the day. Of course we need to document our bonding lol. Participants to Family Walk and 5k Run. 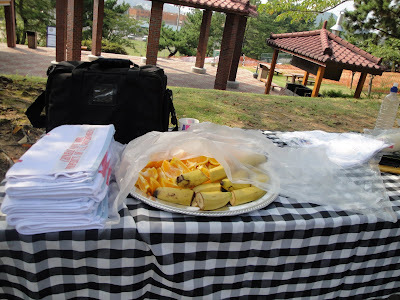 After the sweaty activity for the day, we were served cut up apples, bananas, oranges and water to drink. We also got a shirt for participating. When we came home, my husband wanted us to go to the mall but I don't feel like going. I was tired plus I already started doing our laundry. I cooked some pork ribs bbq (baked), steamed beans and rice. While waiting for the food to cook, hubby started vacuuming our carpet. He then steamed it afterwards. Now my fingers are hurting because I scrubbed for almost an hour on the wall, cleaning up my son's arts. With the help of Magic Eraser from Mr. Clean I was able to cleaned it up. But man, it was tough, he used ball pen to write on the wall. So we were literally on LABOR today lol.. But its worth it because now we have a clean house. 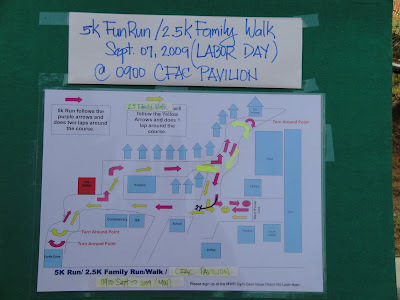 Your labor day sounds like a labor of love too :-) A walkathon is a nice family activity. You get exercise and the food at the end of the walk is healthy. Thanks for sharing the sweetptr link. Maybe I should start learning this kind of thing. sarap naman. magandang bonding with family and friends. nag-sign up na ako sa sweet ptr under your name. thanks for texting me. hindi ako naka-reply sa text mo kase wala kong load. lol! thanks again and God bless your family! Always fun ang family bonding nyo,Ate Rose! !Happy to hear about it! It's a nice way to celebrate Labor Day. Our Labor Day is this coming October but haven't participated any activities yet because I love to..hehehe..
thanks pala sa comment Rose at visit..
Sure you guys had had so much fun & tiring day during the labor day. 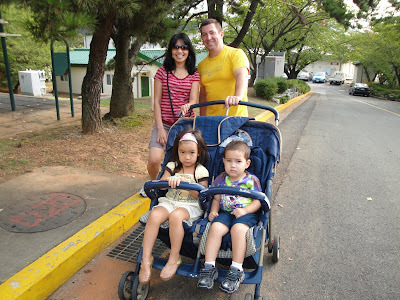 Just 2 families joined the Walkathon? I could understand you, maybe they were celebrating Labor day bbq-ing. You did have a "LABOR" day, hahaha! srubbing your son's wall..been there, done that, and still doing it.. Ball Pen inks are hard to get rid off. When the youngest turns 5, you will be able to relax a little bit..I got 3 more years to wait, wahhhhh!